Mount Vernon Mayor Richard Thomas at press conference staged in front of Mount Vernon City Hall. 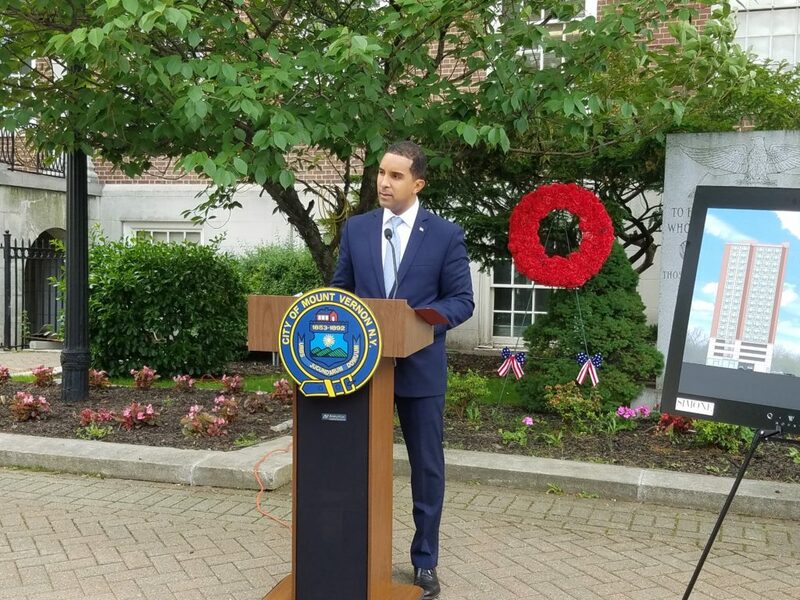 MOUNT VERNON—Multifamily investors, who have bypassed this storied Southern Westchester locale for decades for such Westchester cities as Yonkers, New Rochelle and White Plains, are finally taking notice of the City of Mount Vernon for both its opportunities and challenges. Mayor Richard Thomas, who took office in January 2016 on a platform of reform, an effort to fix the city’s aging infrastructure and bring private investment back to the city, held a press conference on Friday, June 2nd to announce four major new market rate housing projects in the city. In total, the four new developments approach approximately $323 million in investment and will add 880 new housing units. All four of the projects have either been approved by the city or are in the approval process and could break ground within a year. Several proposals are close to beginning construction in the next three to four months, the mayor noted. 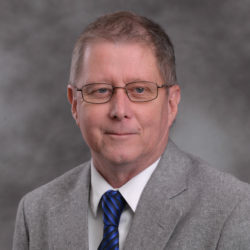 At the press conference, David Gentner, president and CEO of The Wartburg senior care services campus, announced that it is studying developing approximately 140 units of senior market rate rental housing on its Mount Vernon campus. Gentner said The Wartburg hopes to select a developer, close on financing and begin the estimated $65-million project by year’s end. The Wartburg project would bring the total number of units announced at the press briefing to 1,028 and the total development investment in the City of Mount Vernon to approximately $388 million. The mayor, who has had his share of battles with the City Council since taking office, said the development wave taking hold in Mount Vernon is due in large part to investors trying to take advantage of Gov. Andrew Cuomo’s recent $2-billion initiative to build affordable housing in New York State. He also cites reforms in the approval process that have been implemented recently as well as rezoning of certain sections of the city in order to spur new development. “Mount Vernon is moving forward,” Mayor Thomas said. “This begins the next chapter of Mount Vernon’s story, which is ‘Mount Vernon Rising.’ There is a renaissance happening here.” He added that the city will in coming weeks announce new restaurant and retail openings, as well as the results of studies the city has conducted geared to helping developers leverage more resources to build new projects in the city. Library Square—a $125 million, 320-unit high-rise project at 20 South Second Ave. to be developed by Direct Investment Development of New York City and partners. Carlton Brown, co-managing director of Direct Investment, which has developed a number of projects in Harlem beginning in 1996, said Mount Vernon has been historically “underinvested.” Brown said that his firm has undertaken transformative projects in “communities that people have written off, but had underlying value that no one had mined” and saw an opportunity to harness the city’s potential at the Second Ave. project site. He said the Library Square project will include approximately 100 units that will be catered to the “creative class.” Noting the recent decision by President Donald Trump to exit the Paris climate change accord, the Library Square project, when completed, will utilize 80% less energy than the New York State energy code requires. Brown said that his firm is seeking several zone changes, including the creation of a Mount Vernon East Arts District in and around the Mount Vernon East Metro North train station. He said that he expects to secure all necessary approvals and break ground on the project in the spring of 2018. A rendering of the $90-million 42 Broad St. project to be built in the Fleetwood section of Mount Vernon. 42 Broad St.—A $90-million, 249-unit tower project in the Fleetwood section of the city being developed by The Alexander Development Group. The firm is within weeks of closing on the financing for the market-rate rental development, according to Mark Alexander, principal with the Alexander Development Group. 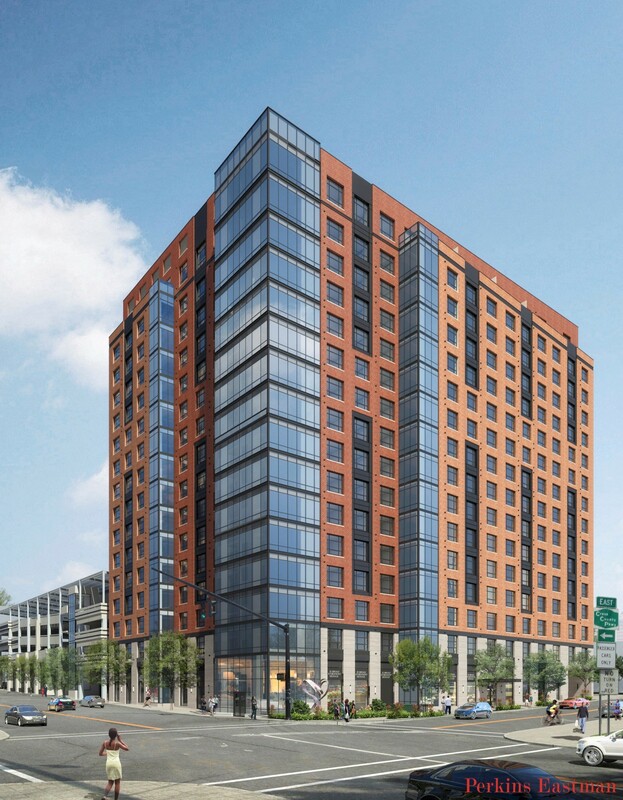 He said the project will be the “first planned luxury rental development in Mount Vernon in over 50 years.” Alexander added that the project will also be built energy-efficient and will include co-generation as well as a host of high-end amenities. 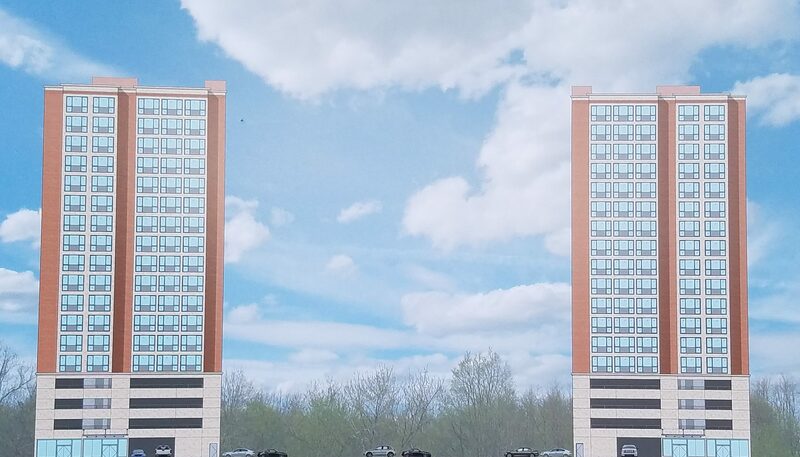 7-11MacQuesten Parkway—is a 140-unit twin-tower building project called “Q West Towers” to be developed by Simone Development Companies of the Bronx, which recently completed the redevelopment of the former Boyce Thompson complex in Yonkers. A rendering of the Q West Towers project to be developed by Simone Development Mount Vernon. The $60-million project in Mount Vernon is expected to break ground by the beginning of 2018. Mayor Thomas noted that the Simone project being developed by the Mount Vernon West Metro North train station will look to benefit from Gov. Cuomo’s affordable housing fund as well as from the recent rezoning of the Mount Vernon West area around the station. The mayor noted that the Simone project will be the first development proposal to take advantage of the city’s new 45-day permit process. L’Judie Simmons of Simone Development noted that the apartments at the development will be priced to meet the needs of the area’s workforce. “If you are a fireman, policeman, city worker—these buildings are for you. You will not be disappointed,” she said. Joseph Simone, principal of Simone Development, noted that he grew up in the Fleetwood section of Mount Vernon and was a graduate of Mount Vernon public schools and because of that the project is very personal. “I truly have a love for Mount Vernon and would like to see it flourish again,” Simone said. 525 and 645 MacQuesten Parkway—A 179 unit, $48-million apartment project being developed by Enclave Equities. Sam Mermelstein, vice president of development for Enclave Equities of Purchase, said he is hopeful to begin construction soon on the project geared to attracting young millennials to the City of Mount Vernon. Enclave previously redeveloped a former Verizon call center on South Fifth Ave. into the Enclave on Fifth, a senior affordable housing project with a 22,000-square-foot Westchester Community College extension center. The mayor at the press briefing staged in front of City Hall also introduced the new executive director of the Mount Vernon Industrial Development Agency Stacey Brayboy, a former official with the U.S. Department of Agriculture during the Obama administration, and Elvis Cordova, a former Obama administration appointee and now an official with the Mount Vernon Urban Renewal Agency.